The UChicago track and field team will look to defend their UAA title this weekend at conference championships in St. Louis. The two-day meet will pit the South Siders against six conference rivals: Brandeis University, Carnegie Mellon University, Case Western University, Emory University, NYU, and Wash U. Expectations are sky high for the women’s team, following their second-place finish against tough, nationally ranked competition last weekend at the Wheaton Twilight Meet, and their first-place finish the weekend before at the Chicagoland Championships. 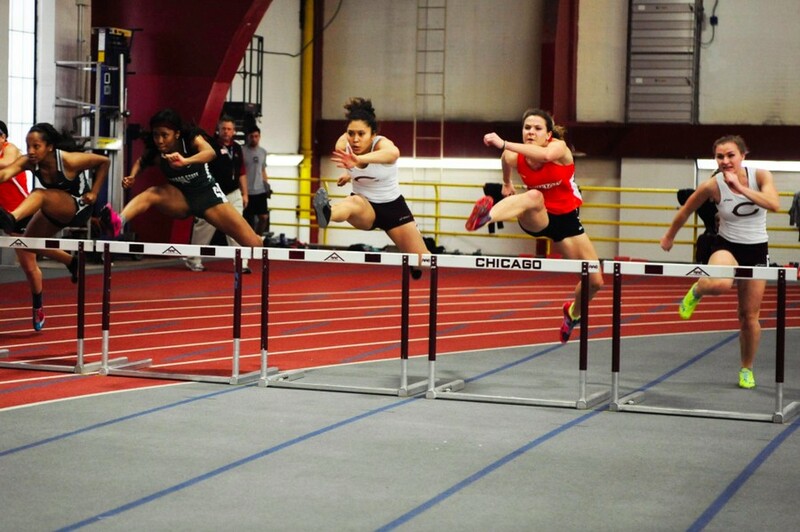 “After finishing second at the Wheaton Twilight Meet this past weekend, and first at the Chicagoland Championships the weekend prior, the women’s team is excited to compete at UAA [championships],” said first-year sprinter Emma Koether, who was a member of the 4x400-meter team that took first place at Wheaton with a time of 3:49.59. Many Maroon women are looking to defend their championships in their respective events this weekend, including the 4x800-meter team, which included second-year Cassidy McPherson, third-year Michelle Dobbs, and fourth-year Brianna Hickey—all returning runners. With the field events, fourth-year Nkemdilim Nwaokolo is looking to repeat her first-place performances in the shot put, hammer throw, and discus. Fellow fourth-year Nelly Trotter will defend her first-place performances in the high jump and triple jump as well. The squad used eight different first-place finishes last weekend in their 132-point performance, losing by just six points to Illinois Wesleyan University, which is ranked sixth best in the country. The competition will remain similar this weekend, as Wash U is the No. 8–ranked team in the country. The Maroons are not scared, however. Meanwhile, the men’s team is coming off its own fifth-place finish in Wheaton and fourth-place finish at Chicagoland, and will be looking to make an impact. Holding two first- and second-place finishes on the season, the squad is hoping to better its results from last year, when it finished in third place. While the Maroons’ last two results haven’t been the most encouraging sign, there is good reason for optimism when looking at this group. The team will be looking for strong performances from some of its main contributors on the season, such as third-year Temisan Osowa, second-year Patrick LeFevre, and fourth-year Ryan Manzuk. All three have been integral parts of the South Siders’ success this year, and will be key factors in the push for a UAA title. If they, along with Chicago’s other stalwart members, come up big this weekend, the Maroons might turn some heads. The UAA Championships will start this Saturday at 9 a.m. in St. Louis.